Life Before the Dinosaurs: Panderichthys. Panderichthys is a sarcopterygian (lobe-finned fish) from the late Devonian Period. It was about three feet long and probably lived in shallow water. It had many tetrapod-like features and was probably related to tetrapods. There are two species of Panderichthys, P. stolbovi and P. rhombolepis. Although it didn't come up onto land, it could probably have propped itself up with its fins. Panderichthys had a flattened head that was similar to a tetrapod's head. 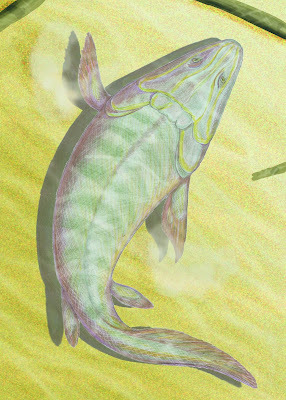 It also had eyes on top of its head like Tiktaalik and some early tetrapods. Panderichthys had finger-like bones in its fins that did not have joints. It had a spiracle, like insects and some fish do today, which would have allowed it to breath if it was buried in sand or mud. Panderichthys probably moved along the bottom in search of prey. 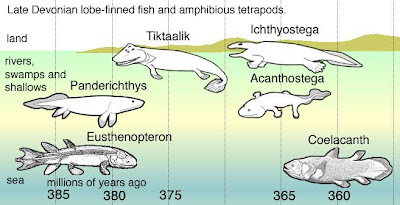 There are many differences between fish and tetrapods, and Panderichthys had many tetrapod characteristics. Panderichthys is very important because it shows some transitional features between fish and tetrapods.